By 1589, Thomas Bullock found it necessary to sell the manors of Arborfield and Barkham to Edmund Standen, who was a Clerk of the Petty Bag of the Court of Chancery. This sale was contested by the Bullock family - click here for more details. Edmund Standen died in March 1603, the year the Jacobean manor was built, to be succeeded by his son William, who lived at Arborfield Manor with his wife Mary until his death in 1637. In 1615 Sir William was Sheriff of the County of Berkshire. In 'Barkham: A History', it states that William died childless, and his heir-at-law was a kinsman called William Ball, who was the grandson of Edmund Standen's second brother. The Arborfield and Barkham estates passed instead under a family settlement to another kinsman of the same name, William Standen, who was the grandson of Edmund Standen's fifth brother. William Standen (kinsman) and his wife Sarah lived at the mansion house at the Barkham Manor site, while Mary Standen, widow, continued to live at Arborfield until her death in 1645. William and Sarah then moved to Arborfield while his kinsman William Ball took up residence at Barkham. William Standen was High Sheriff at Berkshire in 1648, and at some time was a member of the Barber Surgeons' Company in the City of London. Mary Standen was the daughter of Samuel and Elizabeth Backhouse of Swallowfield House. There is a considerable amount of information about the Backhouse family in 'Swallowfield and its Owners', written by Constance Russell, wife of Sir George Russell, M.P. for Wokingham, in 1901. This interesting book is freely available to download on the Web. Molly lived to be 76 and died unmarried. Edward instead married a lady called “Eleanor”. They had no children and he died aged 27 years in 1730, therefore Arborfield House passed to a cousin, one Richard Aldworth, but being a minor, his guardian sold it under an Act of Parliament to Pelsant Reeves of Yorkshire. Richard Aldworth also owned Stanlake Park, near Twyford, and Billingbear Park, near Wokingham; he was father to the first Lord Braybrooke (who was raised to the peerage in 1797). The Standen family held the right of Patronage to the parishes of both Arborfield and Barkham, and in 1640 they presented the then rector of Barkham, Stephen Rose, to the living at Arborfield. We don't know how long he stayed in both positions because there are few records surviving from the period of the Civil War (1642 - 1646) and the Commonwealth (1649 - 1660). At the end of this period, Alexander Stokes was presented as Rector of both Barkham and Arborfield by William Standen and his kinsman William Ball. In the book 'Barkham: A History', we learn from the Hearth Tax Returns that Alexander Stokes lived at Barkham from 1662 to 1664, and that there were four fireplaces at the parsonage house. However, he later moved to the rectory at Arborfield. The next Rector, John Sale, was presented to both parishes in 1694. In 'Barkham: A History', David French states that Sale was not presented by the Lord of the Manor, Edward Standen, but by Samuel Sale, merchant, to whom the right to make the next presentation appears to have been leased by Edward Standen. The Standen Tomb can be seen in Arborfield Church; it was moved from the old church in 1939. Here are some views of the tomb, with a translation of the plaque on the tomb and the plaque on the west wall of the church. Translation from Latin: "William Standen of Arborfield, renowned for his Descent from an Attrebation, the year wherein James the best of Kings was born, died May 18th 1637. Who in this age, detained Justice upon Faith, gave hospitable Entertainment to banished, cherished frozen Charity in his Bosom, loved Mankind in general as his Friends, and his Friends as himself. Who supported his Learning with Gravity, old Age with Sweetness and alacrity, and Death with a Strong Faith towards God. All that was Mortal of him, was deposited here, where too, his dear Wife, dear upon all Accounts: Mary, the fourth daughter of Samuel Backhouses of Swallowfield, order herself to be interred, who was conspicuous for her Chastity, Piety, and Charity to the poor. "Hard by the dearest of the Sons of Nicholas Love Esquire, who was born April 11th 1637, and died May 3rd 1638, on the Day of Christ’s Ascension into Heaven is Celebrated." Sir William Standen was proud of his descent from the Attrebates. They were a tribe of people who came and settled in England from part of what is now Belgium. They came before the first Roman conquest, and one of their settlements was later the Roman town of Silchester. 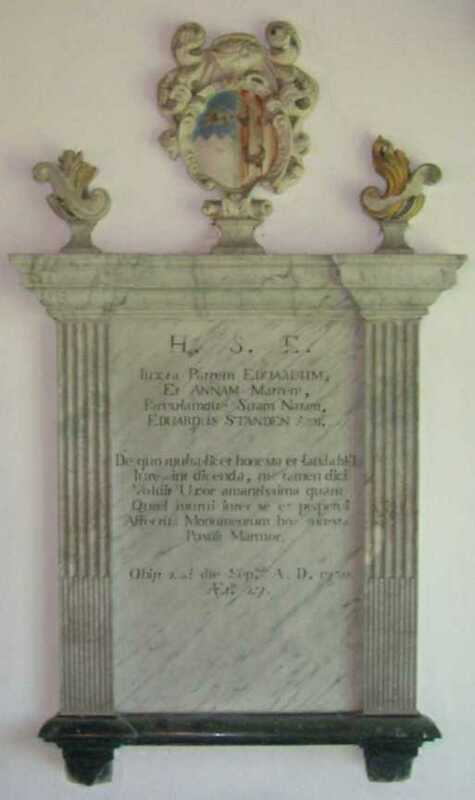 Translation of the Wall Plaque: "Near his Father Edward and his Mother, Anne, and their little child born to them, Edward Standen Gent concerning whom many honest and laudable things would be allowed and might be said. Nevertheless, nothing is said. His most beloved Wife has wished an account of the Mutual and Perpetual affection between themselves. "Grieving to place this Marble Monument. 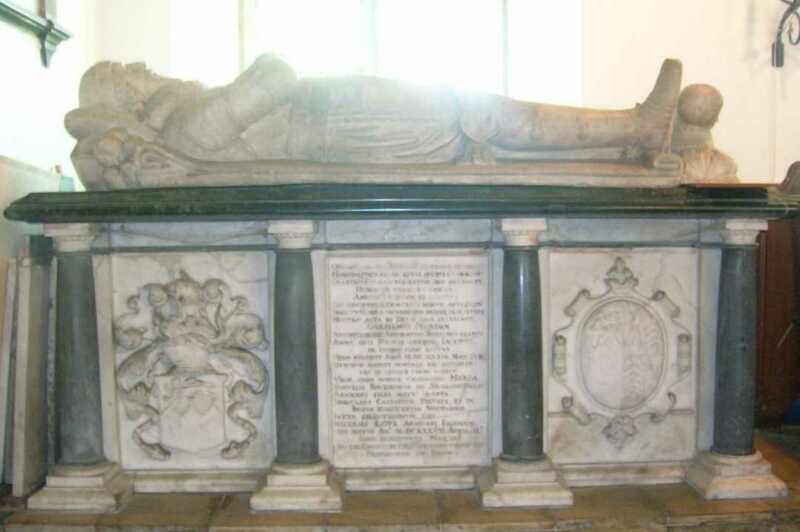 Died 23rd September AD 1730 aged 27 Grandson of Sir William Standen." Acknowledgement: 'Barkham: A History' by David French and Janet Firth. Copies are available from the Barkham History Association. Reading Local Studies Library has an engraving showing the Standen Tomb when it was in the old church in around 1842. 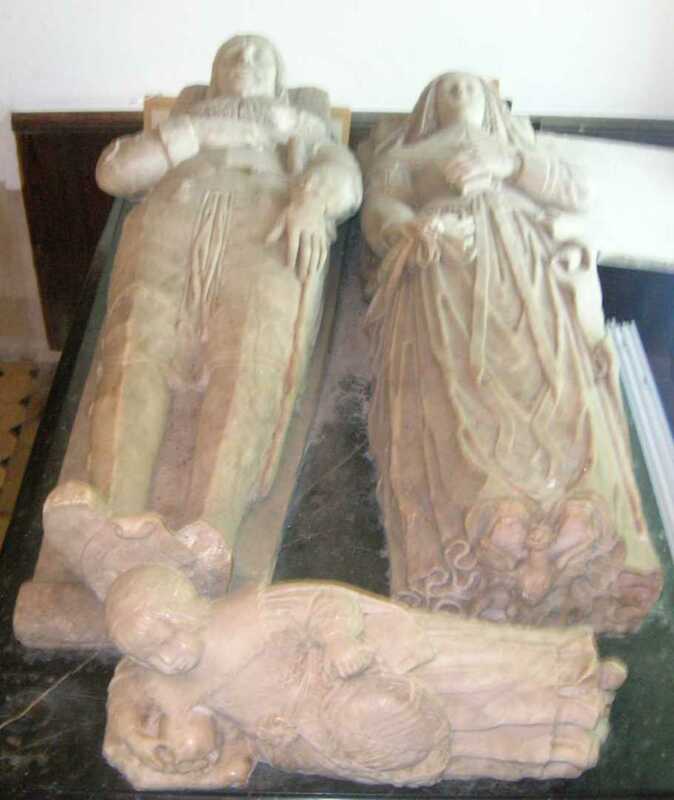 Its web-site describes the engraving as follows: 'The tomb of Sir William Standen, who died in 1639, and Maria, his wife. The monument was later moved to the new church, on a different site. Print, drawn by E. J. Niemann, and engraved by S. Williams, from "The Environs of Reading" by J. G. Robertson, published in 1843'. You can see the engraving by clicking here. Note that the husband was on the right on the engraving, whereas he is now on the left. Also, the young daughter is now facing away from her parents, whereas before she was facing towards them, obscuring the skull on which she rests.